"Chief of Zhongjia 仲家的主将 (zhòng jiā de zhǔ jiāng)"
Brave, ferocious, but not the quickest thinker. 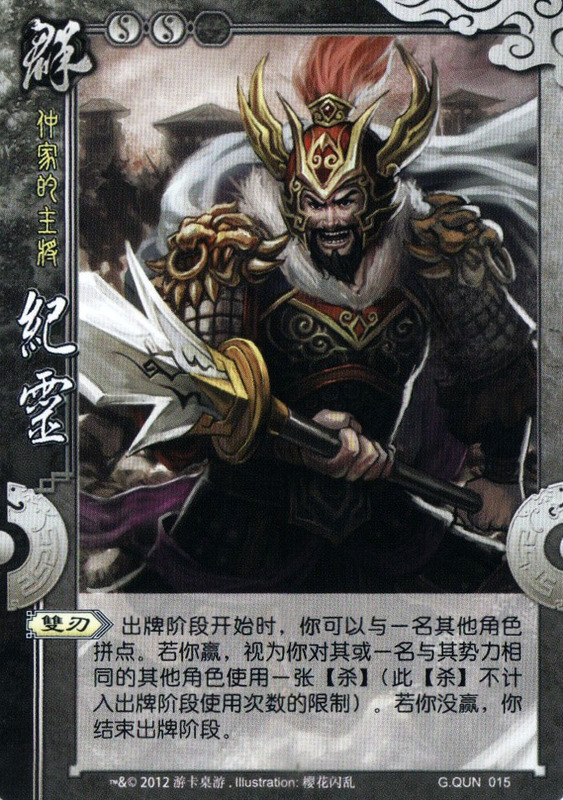 Ji Ling was the chief of Yuan Shu 袁术’s forces and wielded the TRIDENT GLAIVE 三尖两刃刀, one of the new weapons in Kingdom Wars. His skills were said to match those of Guan Yu 关羽, but in one famous encounter, Ji Ling was knee-deep in a clumsy predicament. While on orders to destroy Liu Bei 刘备, Ji Ling was summoned by Lu Bu 吕布 to a meeting. What Ji Ling did not realize was that Lu Bu was planning to coax Ji Ling to back away from Liu Bei. Lu Bu told Ji Ling that if should he (Lu Bu) be able to strike his halberd with an arrow from 150 paces away, Ji Ling would fold his troops and go home. Ji Ling claimed that such a feat was impossible, thus he foolishly gave his word. Cue one of the biggest facepalms in Three Kingdom's history as Lu Bu comfortably let fly an arrow that struck his halberd with a loud clang. Ji Ling marched on home to a momentous scolding from his lord! Character ability: "Double Edged 双刃 (shuāng rèn)"
At the beginning of your action phase, you can conduct Points Duel with another player. If you win, it is viewed as you using an ATTACK 杀 on that player or on another player from the victim's Kingdom (this ATTACK will not be considered in calculating the number of ATTACK cards used in your action phase). If you do not win, you action phase is ended. According to ZYZ, there are four implicit meanings of “Double Edge”. Firstly, it refers to the bet between Ji Ling and Lu Bu. If his opponent wins the bet, Ji Ling would be forced to retreat. In terms of game mechanism, if he does not win the points duel, he would lose his chance of action. Secondly, it refers to his weapon, the TRIDENT GLAIVE, which was three-pointed and two-edged. Thirdly, if Ji Ling wins the points duel, he would be able to strike twice (the virtual ATTACK and the ATTACK used in the action phase). 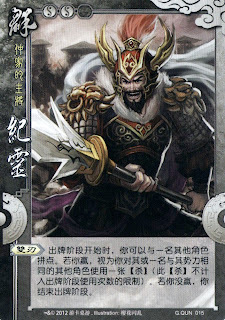 Fourthly, if Ji Ling loses the points duel, he would lose his action phase, so the ability is double-edged. If he wins the first point duel, can he conduct another one until he loses? Or is this limited once per turn?